Well, happy blog-birthday to The Ts! Yep, I started this blog March 27, 2008. I have to say, I'm glad I've stuck with it. I looked up my blog stats to see which posts have seen the most "traffic" since the beginning. The internet is a funny place, so the list is pretty random. Still, as you might expect, all of them are from since we moved to Luxembourg in mid-2012. We stumbled upon a lovely little hiking loop in the Little Switzerland region of Luxembourg last month when Grammy was visiting. 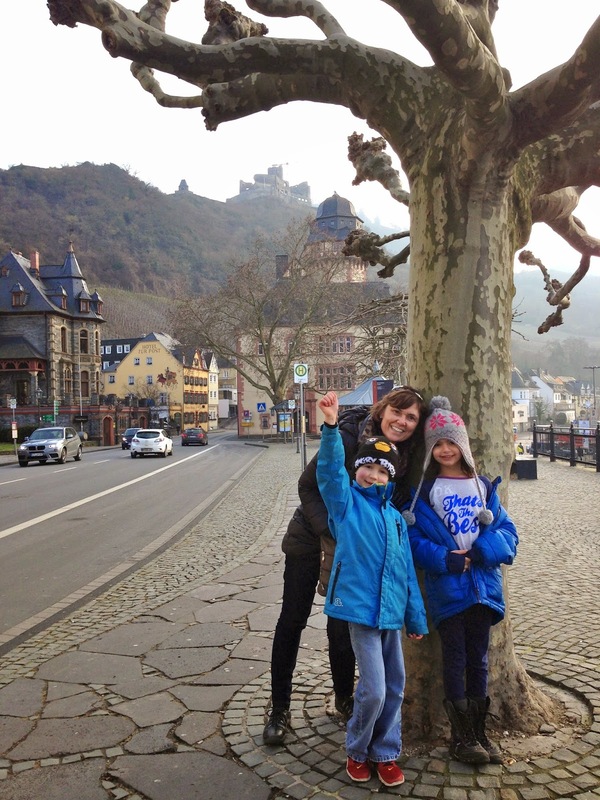 If you are visiting Luxembourg, or you live here and have family in town and are looking for something "Luxembourgish" to do, this could be the post for you! Hiking in Little Switzerland is popular among both residents and visitors, but it can be difficult to get to the trails without a car. We drove to this spot in Beaufort, but as my pre-car days in Luxembourg aren't too far in the past, it occurred to me afterward that this could be a good option for public transport users looking for a walk in the woods. The hike starts at Beaufort Castle, which is quite close to the town and the key to its accessibility. The national public transport site/app is mobiliteit.lu, which I honestly find a bit difficult to navigate at times, even when it's set to automatically translate. There are a few bus lines that go to Beaufort from the city center; some have transfers, but a direct line is 107 and takes just over an hour. Härewiss stop shown near traffic circle on the right. Castle is just above the CR 128 sign on the left. You can visit the inside of the castle (which we haven't done yet, and it was closed this last time). I can't remember if it was this exact image, but this is close enough. And, I realized we totally heard a woodpecker in the spot marked with a woodpecker! I'm afraid I also can't remember the loop's exact distance, but I can tell you that it took us an hour and a half, and that we were not breaking any speed records. The first half the hike follows the stream and is quite flat and easy. Choose a partially sunny day for the best effect of the light through the trees as you walk. Halfway through you make a turn up a hill to loop back around toward the town. It's fairly obvious where to go so you're not likely to miss it if you're paying attention. Follow the little wooden signs with birds on them. There are also some purple trail dots painted on trees, as well as lamp posts when you get back to the town. When we had nearly reached the town, we were met with this sign blocking our trail but pointing the other direction. Danger of Death! Hmmm. The only thing we can figure is that there were several fallen trees partially blocking the path along the way which we had to go around, but it wasn't anything drastic that we couldn't climb past with relative ease. There must be workers there during the week to take care of this, hence the "travaux forestiers." There was no sign stoping anyone from the other side of the trail. Anyway, full disclosure: I am recommending a hike with a death warning. Just be careful and maybe stick to the weekend for now? At the end of the trail, you emerge from the woods and walk through the town and back down the hill a bit to the castle. You can walk back to the castle if you parked at the lot, or head back to the bus stop. And there you have a bus-friendly hike! I have vowed not to forget my carless days! 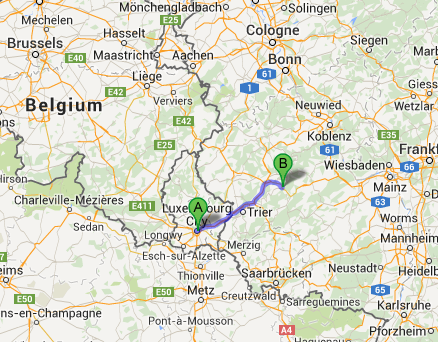 For more of our Luxembourg castle visits, see my Where We've Been page. 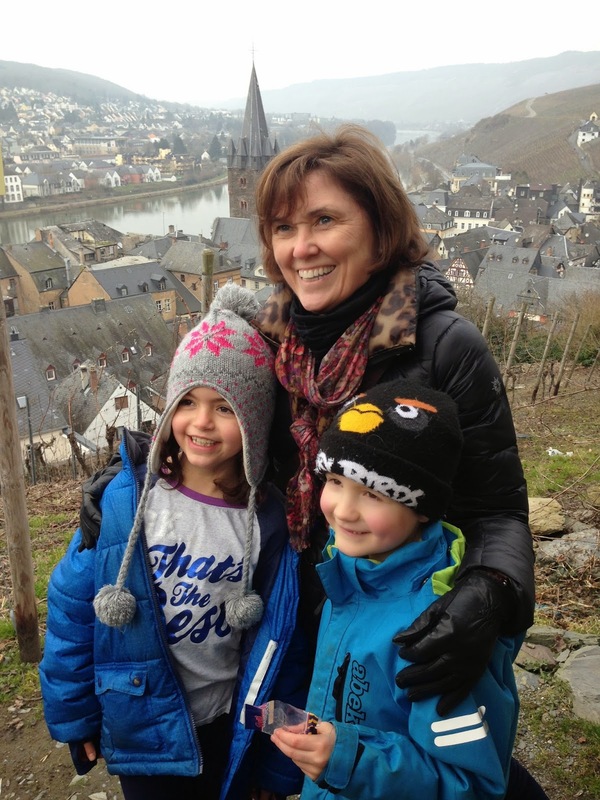 When Pete's mom visited over the Carnival school break in February, Pete took Monday off and we headed to Bernkastel-Kues for the day. It's been on our list of "cute, Europe-y, half-timber-y towns to visit in Germany" for awhile. 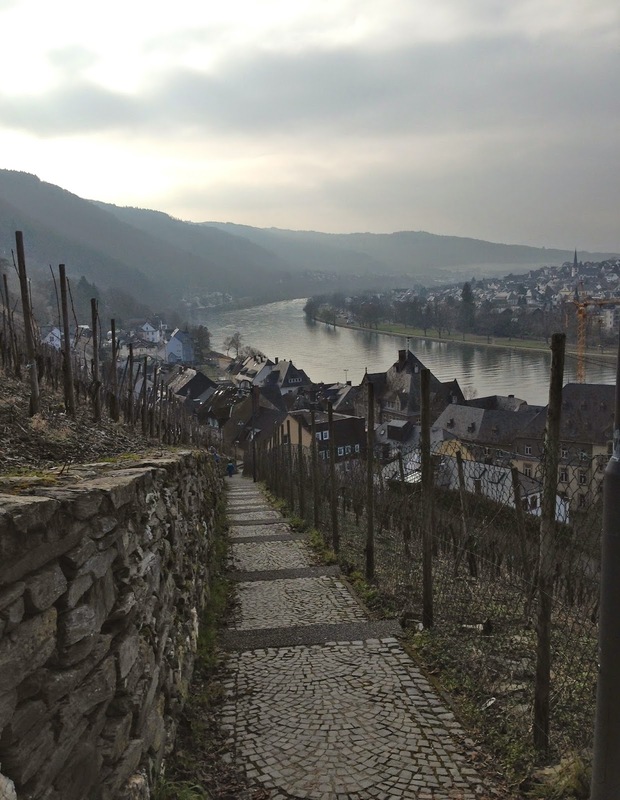 Bernkastel is on the right bank of the Moselle River, Kues on the left. 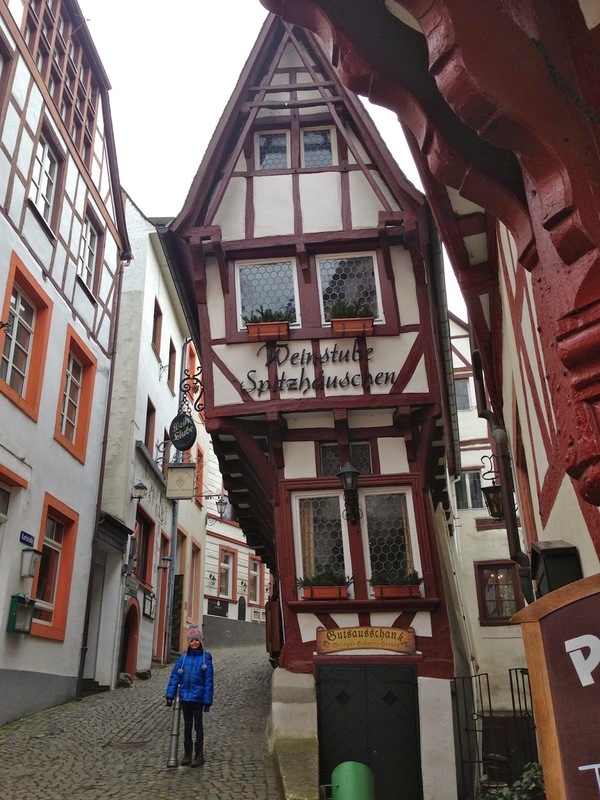 Bernkastel-Kues was indeed cute, half-timbered, and Europe-y, but it was also very, very closed. In fact, it slowly dawned on us that the entire country of Germany was probably closed, and Google later confirmed this. Who knew that Germany observes public holidays not only on Shrove Tuesday and Ash Wednesday, but Shrove Monday as well? Luxembourg actually has none of these public holidays (only the kids are off school for the week). You'd think after nearly three years in Europe we'd learn to check if the neighboring country is closed before we went there, but you'd be wrong. I still get caught out on trips to IKEA right across the border in Belgium all the time. Also, public holidays in Europe are different than those in the US in that restaurants and retail often also close down. So yeah, no big Shorve Monday Blow-Out 70% Off Sales to be found. Anyway, it was nice to have the town almost to ourselves. cute and Europe-y enough for ya? We managed to hunt down an open restaurant and have a very German lunch before heading up the hill to the Castle Landshut ruins. Well, the castle ruin was so closed off and "under construction" that we couldn't even get to the viewpoints on the hill. It looked like it will be closed for quite awhile; perhaps they will at least partially reopen it this summer? There was also a little wine-tasting restaurant on the way up - closed, of course. But despite these minor disappointments, we couldn't really complain. Perhaps we'll come back another day, crammed in with hundreds of other tourists, and long for the day when Germany was closed. Although most of Daphne's school work is in German and French these days, they do still work on a bit of Luxembourgish most weeks. It's one of Luxembourg's three official languages, after all! Daphne must read this story tomorrow at school "with no mistakes." It is often said that Luxembourgish is a dialect of German (but it's generally accepted that this is not polite to say to a native Luxembourger's face.) 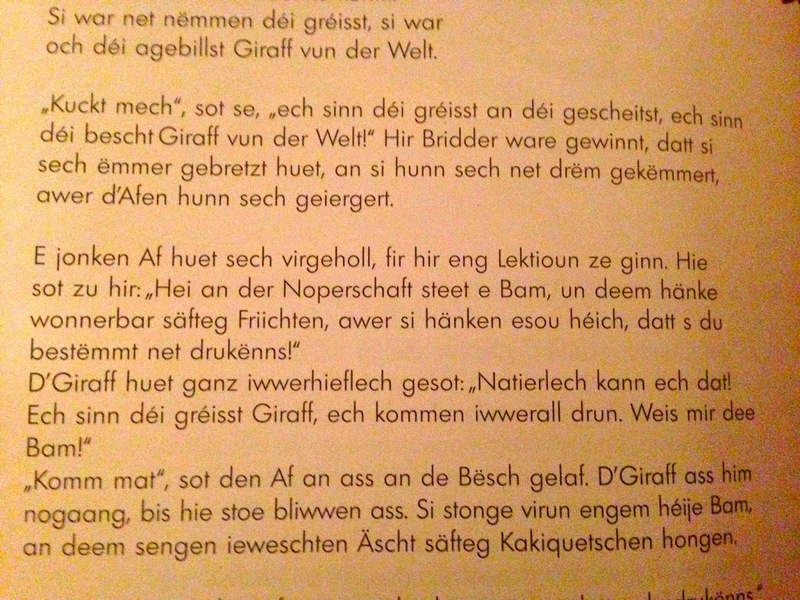 To me as a monolingual foreigner, it sounds like a sort of soft German with some French thrown in, and looks like a combination of Dutch and German. Anyway, I don't get many blog comments these days except for spam, so I thought it might be fun to solicit some this time. 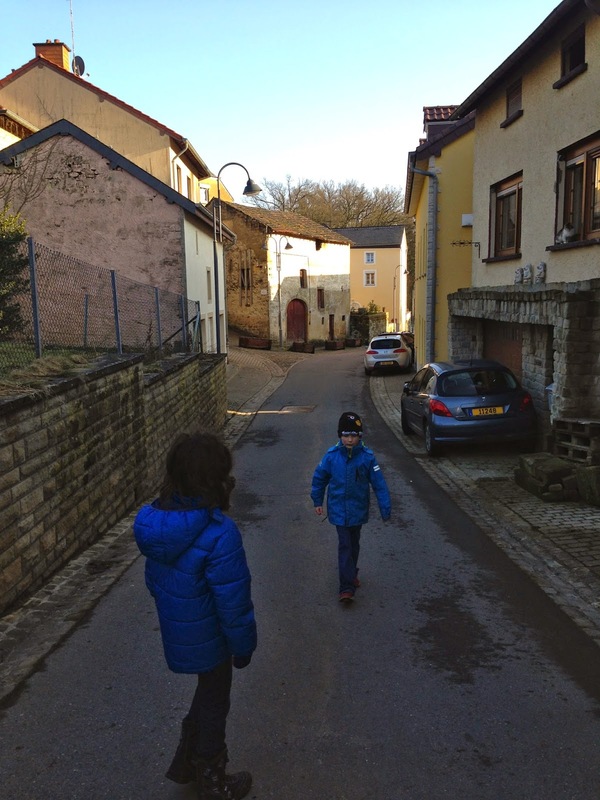 Fellow foreigners: What does Luxembourgish sound like to you? What does it look like to you? Native Luxembourgers or fluent Luxies: how's Daphne doing? Are you offended if people call Luxembourgish a dialect of German? Have you ever been to Haiti!? !